“In This Together” black edition, mini prints and more surprises. 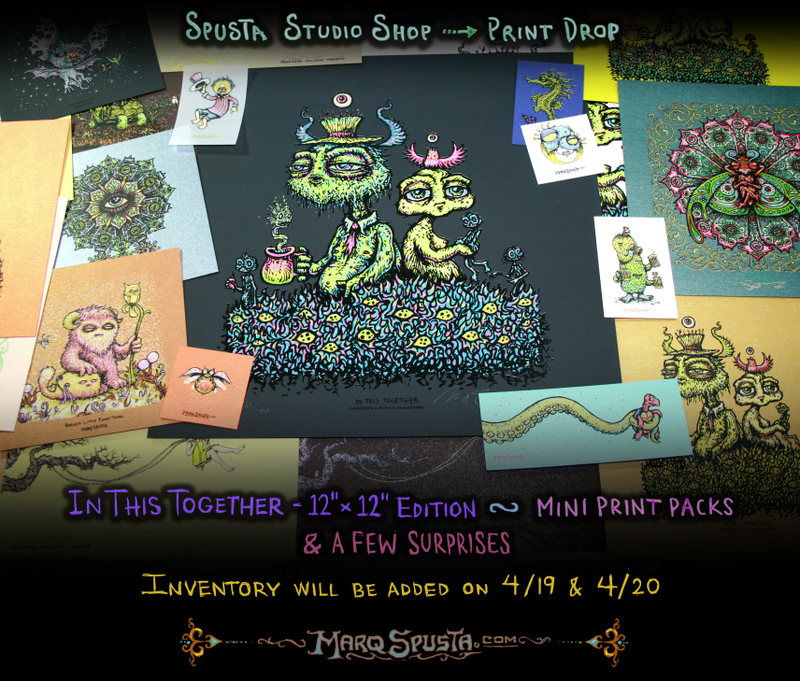 A batch of prints will be released in the Shop today (4/19) and tomorrow (4/20). A colorful new variety of mini screen prints including Spring Swing, Bliss Bug and In This Together will be made available at a random time today and if that batch sells out, more will be released Saturday. There have been a lot of requests to print larger editions of some of the mini print artwork. The Spusta Studio Facebook Page took a poll of which minis should get the bigger treatment, and there was a clear favorite. 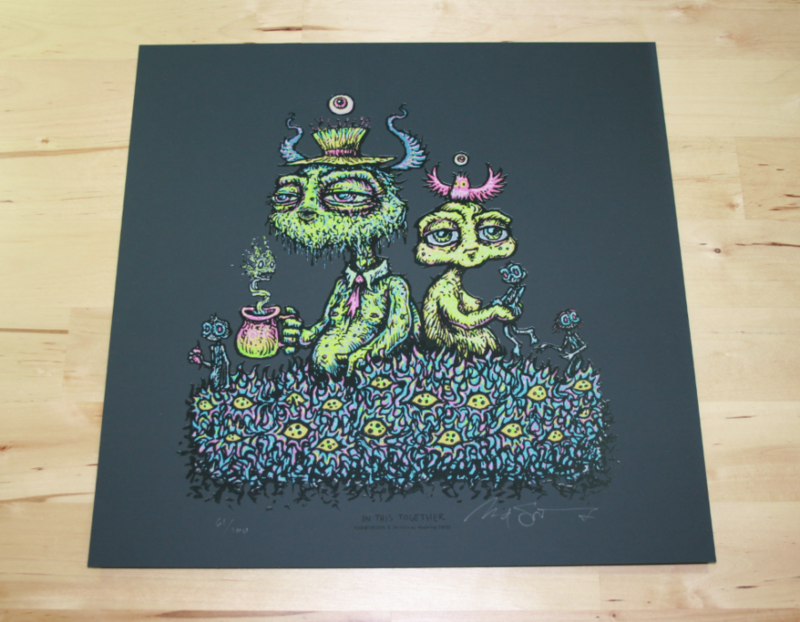 “In This Together” was printed at the size of a record album (12″x12″), with vibrant inks on black rubbery paper in a signed and numbered edition of 100. A Crystalized Variant of this print that may make a brief appearance in the Shop for those that happen to catch it. A new mystery print will also be released in Shop sometime over the next few days. Watch for the image to be posted to the Artwork Portfolio, Facebook, Instagram or Twitter first, then the print will be added to the Shop shortly after. Since there will be so many different staggered releases over the next few days, some customers may find themselves placing multiple orders. The Studio Gnomes combine those orders into one package shipment when possible, so we encourage customers to use the “comboship” discount code to save the shipping costs on multiple orders. Along with all the drops in the Spusta Studio Shop, there is going to be a new Spusta print release elsewhere on the internet on 4/20. It’s still a secret, but it will be posted here as soon as the cats are out of the bag. For now, I’ll say that I was thrilled to work on this art for such an inspirational figure – and I’m rather pleased with how the print turned out. Stay tuned…. With the swings are you going to have to pick up the blue to get a varient, or will they be completely random? Good question Daniels, Swings are new, varied and completely random. The regular blue ones are gone. mini swings to frame around the OG. Sounds like a plan. Hope I get in. Also super intrigued by the 420 print. Speaking of which it is lunchtime, friday, and time for a burndown. Striked out on that first drop. Hope score a 12×12 regular and crystal and some swings. This is ginna be a nerve racking weekend. What’s it gonna take to get one of these?? ?